what's up with that blog name? Hello everyone! The post you're looking for is below. When you're done checking out this post, please visit my Etsy Shop with completely unique illustrated cards designed by myself and using a fine natural laid paper! I'm sooper excited to show you this sliding barn door project! Check. It. Out. That's it down there. Okay that's a bright picture, but it's all I gots! So, our funky old house has so. many. doors. Out of EIGHT rooms, only ONE has one door. TWO rooms have TWO doors, and THREE rooms have........THREEEEEE doors! Granted, it's a little bit of a different way to live always zig zagging through this maze, (but I am always comforted that should there be a fire, there's almost always three exits). One of these days I may figure out why this old house was designed like this, but as for now...I dunno. But upon looking into the price of sliding barn door hardware - I thought it would be wishful thinking swept under the rug. I mean, that's not even a, "Well, maybe someday" investment. That's more of like a, "Somebody put me out to pasture if I'm crazy enough to spend $300 on one door" investment. And then, comes Country Living magazine to the rescue - they posted a lovely tutorial on how to DIY this here. Okay, I goofed on the street elbows, and instead picked up REGULAR 90° elbow pieces. What you want is a 90° STREET elbow - and this means the threads will be on the outside of one side of the pipe, rather than the inside- to fit into those floor flanges you see there. Once we got the hardware home, it was just a bunch of measuring, drilling, screwing, and fitting the puzzle pieces together. **It's a little bit tricky drilling into the side of a door - it's pretty thin - so take your time drilling and be careful not to split your wood. Be mindful to go straight in, lest your drill angle out and make a hole through the front or back of your door! **Make sure you measure the extra room for your eyelet hooks. Your pipe will not be fitting directly above your door - I left about 1 1/2" extra for the pipe to go through the eyelets. **When we first started moving the door around, it made an AWFUL squeaking noise. I oiled mine up (with PAM. hehe), and it has worked just loverly ever since! There we go! That's the DIY sliding barn door for ya. And, just FYI, this is what this area of the kitchen looked like shortly after we bought it. This is NOT what it looked like WHEN we bought it. Actually, I wish I had taken more pictures the day we stepped into this house...but just take it from me, there was a crazy black UFO lookin' fan/light in here, and the walls were dingy gray. OOOOOH can't wait to see it in real life~! CAPTCHA!!!! REALLY AMY!? Are you getting spammed that much? How flippin' cute is that door!?? Incredible creativity! Ahhh, I love it! Good job...and I actually like it way better than the example pics you posted! Shoot, that's a great compliment! Thank you! So should I say..."it's nice to meet you Amy Vila" or "You now officially live in a barn!!" I love the bright red door. It's a nice pop of color against the white walls and makes the kitchen look really interesting. I've been meaning to get a sliding door installed for my pantry too, but I've been holding back, not realizing it can be this easy and affordable. Thanks for sharing the DIY link and tips, Amy! Amazing "before" &"after" photos! Your "new" kitchen is fabulous! I'm so inspired! 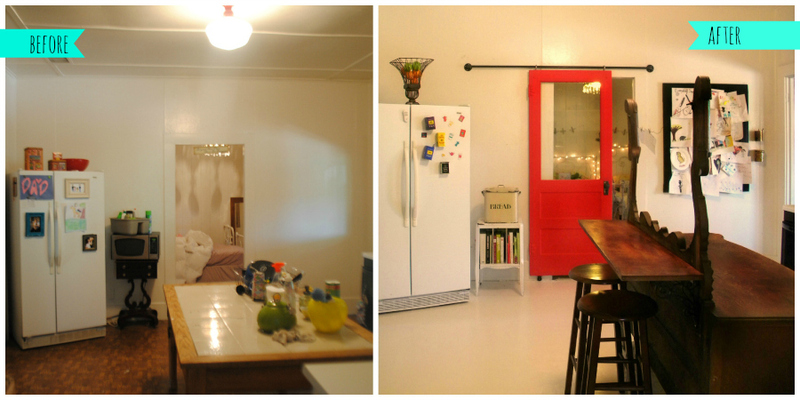 That sliding barn door is a great idea! By the way, thanks for sharing how you did it. You made it look easy. This is something any household can afford to set up. I believe it's okay to invest on your ideal door, but make sure it fits your budget. After all, doors add to the curb appeal of a house. You are absolutely correct when you wrote how cool it is. Well, it is! It somehow gives the room more life and color. 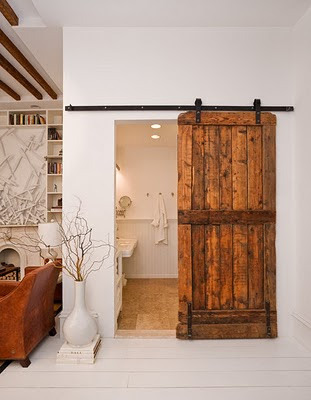 The idea of a sliding barn door is definitely wonderful because this allows homeowners to maximize the space usage in their house. Thanks for sharing! I will be doing this to my house only I will be using old 6ft tall decorative shutters off an old Victorian house!!.. I am curious how well the casters on the bottom keep the door from hitting the frame and scraping/chipping the paint. is there any swing to it at all? Hi Karen! Your place sounds FUN! As for your question about there being any "swing" to it? I hope I understand your question correctly - but if you are asking if the CASTERS swing (like a shopping cart or something) - these do NOT. You can buy them both ways depending on your needs, and these are fixed. The actual door itself never connects with the wall. You just need to make sure you pick out the fixed casters at the store. The casters DO scratch my painted floors. I kind of knew that would happen, but I was so excited to have the door that I decided to ignore that little faux pas. I can be lazy and impulsive like that. :) However I DID at least consider options - and I did see some molding that you could essentially use like a "track" just a long, straight piece of wood with a lip on each side to keep the casters from falling off. I feel that if you just made sure to measure for it to fit, it would work quite well to keep the paint from chipping if you have painted floors like myself. Then you'd just have to mind it so you didn't trip on it - so I guess sometimes it's just a matter of choosing your battles when you're DIYing, huh? Of course, you could always use a rug if it suits your purposes - or it just might not scratch and be damaging to other types of floors like tile? Just some thoughts. So there you go! You asked a simple question and I answered with a ranting paragraph - probably answering questions you didn't even have. Haha! Hope it helps anyways! Amy... A friend just told me they make a small plastic peice for sliding closet doors.. it is basically like the one on the picture on the website below.. you could put it at the outer edge ofthe door..(so it isnt a trip hazzard)... screwed to the floor... when you slide the door open it will stay in that small track. It's a good point. It did squeak something AWFUL at first - but we were able to rub oil on it and haven't had the problem since! Where did you find the door? Hi Chef. So sorry, I sort of abandoned this blog - but I didn't mean to be rude. :S The door was already in the house when we bought it. We removed it from another room that we didn't feel needed a door, and painted it. I like this idea. It would be great in a my home but I would actually prefer clear acrylic on door. Yeah, that sounds way cool, Thomas! Your door track idea is much simpler than the one we found online & used for our bathroom barn door. I love it! Fun touch to your kitchen too. If this was an interior door you already had in your home, did you have to make the door frame a little smaller/more narrow so that the door covers the doorway when it is closed? I live in an old house that was built in the mid 1950's. It has all of the original solid wood doors (some with large panes of glass just like yours), and am in the middle of a project and have convinced myself I can do this. I was already trying to figure out how to use my own door without spending a fortune on a new barn type door all while staying true to my home. I ran across your blog and realized you found a way to complete the project I've had in my head for some time! You've solved the height issue by putting the door on casters. I just wonder about the width of your door vs your door frame since it was an existing interior door. Any advice you might offer would be appreciated! I love it. I think the napkin holder track idea is great. I would suggest a stopper at each end of the space to keep the door knob from hitting the frame. Just curious if you had lowered the pipe just a bit so the weight is on the casters instead of on the hooks grinding along the pipe... Would that also solve the squeak? Is it hard to open and close? love this idea! the possibilities are endless. the country living tutorial lacked pictures. Hello Milkshake, Your sliding door is awesome, I'm making one for my pantry and I pen it. Thanks for sharing. I have wanted and wanted to put sliding wooden doors on (in front of) our glass sliding doors. To put them on the inside kind of like curtains, because my fur babies have ruined the shades or curtains that I had up. Cost has stopped us. But now... yaaaa hooooo. Thank you Thank you so very much. Just one more thing while I am being nosey... Could you tell us how you made your kitchen island/bar? I LOVE IT. I have an old very worn dresser that would work but could use some help or cheat note on how you did it. So Pretty. Thank you again for the door info. Look forward to the possibility of news about the kitchen island/bar. Okay, so the kitchen island is actually my childhood dresser. I took the mirror out of it (and placed it in the living room, as you should be able to see in the living room home tour, then I placed it on four cinder blocks (painted white) for height. Then I added a shelf to the backside and a couple stools for my kids to sit at. Necessity was definitely the mother of invention with that one! If you click on "Home Tour", and go to the kitchen, you can see more pics of the island. What size pipe did you use? Where did you find the eyelet hooks big enough? Well done Amy. You've done a good job. The door is is really looking very nice. These days in the market, there are lot of trending sliding glass doors which can easily enhance the beauty of your home. Would the castors work on carpet? THANK YOU!!!!!! I'm looking at hardware going NO WAY am I paying that. This seriously just saved my day. This set up is much easier and cheaper than some of the other DIY hardware (Let's not even talk about the kits they sell). Plus, this way will help keep a bit of the bulk off of my antique door! just used your idea for 3 rolling doors on our three season back porch. got 7 glass sliding door panels from a friend for 2 30pks of beer! what a deal! made 4 stationary and 3 open. the cats love all the windows. btw, WHO WANTS SOME CATS! I can spare some. anyway, thanks for the great idea. Thanks for sharing these information. It seems really interesting and helpful. I will be happy to get some designs regarding large Aluminum door handles so that a clear rates and will get a proper dimensions regarding the products. Love this!! Thanks heaps for posting. 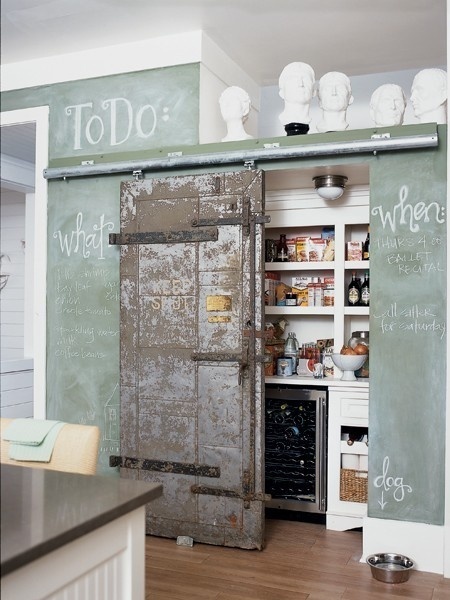 Also the rustic look with blackboards paint is awesome!! Thanks for sharing this content. Get Sliding Doors in Hammersmith with ADV contractors. Just click on this link and get the further information on sliding doors installation. Excellent blog I visit this blog and it really written so well. Red colored Barn door looks nice on room entrance. Thanks for sharing excellent information in blog. It is amazing and wonderful to visit your site.